I have all but completed my Hilltopper 30 modification. I ran into a small snag, but it was a great learning experience for me. I had no audio in the earbuds, so I set out to troubleshoot the radio. Transmit worked (after I soldered a couple of connections I missed - OOPS!) and I have exactly 3 watts out. (my HT-40 puts out 5.9 watts ant the HT-20 puts out 5.8 watts). The signal appears very clean on the scope. The problem was in the transmit mute circuit. Apparently I had a rare BS-170 that was bad. It appears to have an internal short. Nonetheless, it made me THINK to figure out the problem, with a little help from some friends and of course, from Dave Benson. I also made some comparisons to the innards of my HT-20 and that helped me really solidify the source of the problem. Next will come the addition of a display on the 30m version. There will be some scope photos in the appropriate place on the site. This has been a great learning experience for me, especially the trouble shooting. 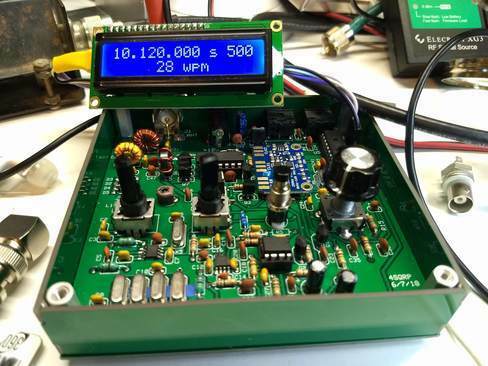 With special thanks to Dave Benson, K1SWL, and Bernie Nazari, K6NAZ for their patience and help with figuring this little radio out and solving the component problem I had with it. Once again thanks to Dave, and to Jim Pruitt, WA7DUY, for supplying odds and ends to speed this project along. Change " 20" to " 10" and recompile/load. Note there is a space before the number within quotes. I have a 1602 LCD and backpack on order- arriving later today. I need to see for myself whether it'll fit on a top cover without interference issues. Fingers crossed! Failing that, there's a NewHaven Display LCD with I2C capability built in- no backpack. Their # NHD-0216K3Z-NS(RGB)-FBW-V3 is an example. Its depth below the panel is 5 mm plus any necessary spacers. The only issue I see is a specified max clock rate of 50 kHz. The Arduino code appears to run at twice that, but dropping the clock to 8 Mhz would take care of that if need be. It's more expensive, of course. I’m very impressed with the 30 meter conversion, as well as the addition of the display! Thanks Lloyd. I found it quickly and I will upload later today. I should be able to actually get the radio on the air today!